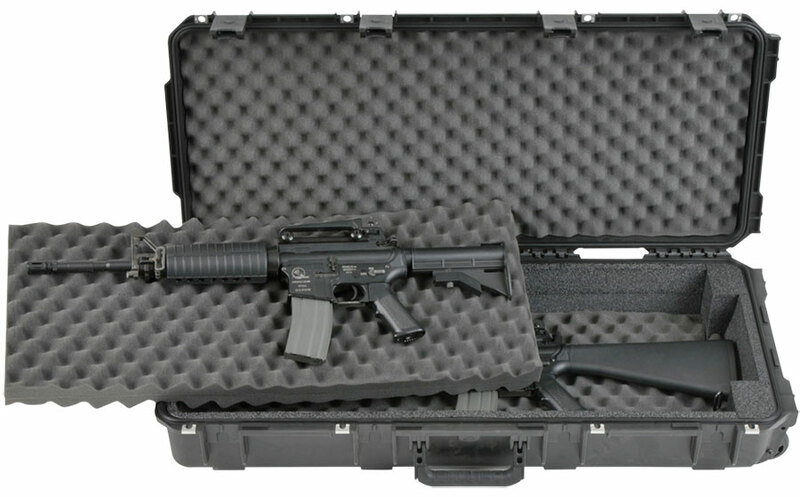 The iSeries 3614- Double M4 / Short Rifle Case (3I-3614-DR) offers the maximum in protection for two short rifles or M4 style rifles with a rigid foam bunk-bed system for protection and stable positioning and convoluted foam in the lid for securing and cushioning of your gear. SKB iSeries Injection Molded Mil-Standard Waterproof Cases are molded of ultra high-strength polypropylene copolymer resin, featuring a gasketed, water and dust tight, submersible design (MIL-C-4150J) that is resistant to corrosion and impact damage. Features a molded-in hinge, patented “trigger release” latch system, comfortable, snap-down rubber over-molded cushion grip handle, automatic ambient pressure equalization valve (MILSTD-648C), resistance to UV, solvents, corrosion, fungus and impact damage (MIL-STD-810F).